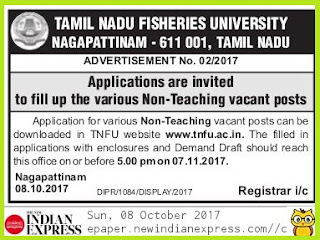 Applications are invited in the prescribed form to fill up the various Non-Teaching vacant posts in the Tamil Nadu Fisheries University for Tamil Nadu Fisheries University, Nagapattinam, Fisheries College and Research Institute, Ponneri, Fisheries College and Research Institute, Thoothukudi, Directorate of Sustainable Aquaculture (DSA), Thanjavur, Krishnagiri Centre for Sustainable Aquaculture (Krishnagiri CeSA), Tiruchirapalli Centre for Sustainable Aquaculture, Tiruchirapalli, Tamil Nadu Fisheries University Academy, Chennai. Application form and instructions to candidates and the details on number of posts and place, communal reservation, scale of pay, qualification as per the Service Rules of the University can be downloaded from the TNFU website www.tnfu.ac.in. 1) Bachelor Degree from a recognized university through 10 + 2 + 3 years system of education. 2) “Certificate course in computer on office Automation” awarded by the Directorate of Technical Education. 1. Minimum General Educational qualification. Preference will be given to degree holders. (c) Typewriting English Higher and Typewriting Tamil Lower. Explanation: Item (b) will be recruited if item (a) is not available and item (c) will be recruited if item (a) and (b) are not available. (b) Must have a good handwriting. B.F.Sc., degree with Overall Grade Point Average of 3.00 / 4.00 or 7.00 / 10.00 or its equivalent is essential. (d) Must have a thorough knowledge of all electrical appliances with special reference to motor testing, battery repairing, armature winding, attending to the installations like electric motors giving connections to motors and starters etc. (c) Must know cycling; (d) Experience of attending on fishes or aquatic animals or Laboratory. 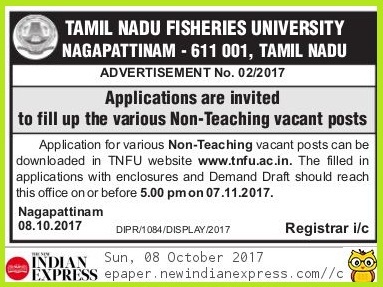 The duly filled in application should reach the Registrar, Tamil Nadu Fisheries University, Nagapattinam-611 001 on or before 5.00 pm on 07.11.2017 along with the Registration Fee of Rs.500/- (Rupees Five hundred only)/ Rs.250/- (Rupees Two hundred and fifty only) in case of SC/ST candidates by crossed Demand Draft drawn in favour of “The Finance Officer, Tamil Nadu Fisheries University, Nagapattinam-611 001” at any nationalized bank payable at Nagapattinam. The Demand Draft should be dated not earlier than 08.10.2017. The candidates should specify in their application form “Application for the post of ______________________________________”. Proof (Photo copies) should be enclosed with the application. Certificates issued after the cutoff date will not be considered. 1. Candidates must be Indian Nationals. 2. Candidates who satisfy the conditions prescribed to the satisfaction of the University authorities should appear before the University Staff Selection Committee for an interview at their own cost when called for. 3. Candidates may be called for interview as per the list prepared by the Screening Committee appointed for the purpose and approved by the Vice-Chancellor. The summoning of the candidate for interview merely indicates that it is felt that he/she with others may be suitable for the post and conveys no assurance whatsoever that he/she will be recommended or selected or his / her conditions specified in the application will be accepted. 4. It will be open to the University not to fill up any of the posts now advertised. 5. The University reserves the right to fill up larger number of posts than the number advertised. 6. Any attempt by the candidates, either directly or indirectly to influence the Selection Committee or other authorities of the University will disqualify the candidate for the post. 7. The service conditions and other terms of appointment in the University are governed by the ASRR of the Tamil Nadu Fisheries University. 8. Candidates selected for the posts shall be liable for transfer to any other post in that category within the jurisdiction of the University. 9. Selection of candidates already in employment will be subject to the employer’s agreement to relieve them. 10. The age of retirement is fifty eight years. 12. The selection for appointment to the above said post is purely provisional subject to final Orders on pending Writ Petitions, if any, filed at Madras High Court and Madurai Bench of Madras High Court.